Sawflies can munch a rose leaf into oblivion in nothing flat. Note all the prolegs on the abdomen of this larva. Japanese beetles have come and gone. Hornworms have had their day. So, just when you thought it was safe to go back into the garden, who should show up but the larvae of sawflies. Sawflies are unusual insects, an ancient branch of the bee and wasp clan. Unlike the larvae of bees and wasps who make their living by eating nectar and pollen or the flesh and blood of other insects, the larvae of most sawflies are plant feeders. At first glance sawfly larvae look like small caterpillars with slender bodies and distinct heads. Upon closer inspection you can see that the posterior segments of the sawfly's body bear small sucker-like appendages called prolegs. Prolegs can be seen on the abdominal segments of moth and butterfly larvae as well, but moth and butterfly caterpillars typically have five or fewer pairs of prolegs. Sawfly larvae usually have six or more pairs. Another difference between these two is the presence or absence of small fishhook like structures called crochets on the prolegs. Caterpillars have them, but sawfly larvae do not. Crochets help butterfly larvae to hold onto the smooth surface of a plant leaf. If you have ever picked up a caterpillar and had difficulty removing it from your finger, you have experienced the gripping power of crochets. 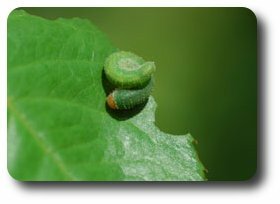 Sawfly larvae are found on many kinds of landscape plants throughout the summer and autumn. Favored hosts are pine trees, oaks, azaleas, hibiscus, and roses. My roses withstood the onslaught of Japanese beetles in good order this summer but succumbed to the jaws of the curled rose sawfly. This leaf-munching machine is insidious due to its beautiful camouflage and huge appetite. It's easy to see how this sawfly earned the name curled rose sawfly. When not actively feeding along the margin of a rose leaf, it is curled up on the surface of a leaf or bud where it blends in beautifully with the plant. After a few days of hide and go eat, the foliage of the rose has been reduced to nothing but veins. When the feast is complete and its development is done, the larva bores into the rose twig where it develops into a pupa. Later a small wasp will emerge. This is the sawfly, so named not because you saw it, but because it has a small stinger on its abdomen called an ovipositor shaped like the blade of a saw. This tiny saw is used to slit the surface of a rose leaf and insert an egg into the tissue of the leaf. The egg hatches and the sawfly larva emerges to munch leaves. Not far away on a river birch tree, leaves have been stripped to the mid-vein, the work of the dusky birch sawfly. These gregarious larvae put on a group performance when harassed by a predator or nosy bug guy. They arch their back and curl their bottom to create a curious “S” posture. Reports in the literature suggest that this behavior is a defense against attackers. Regardless of its significance, the performance is fun to watch and provides a good way to remember that these are sawflies not caterpillars. Sawfly begins with the letter “S”. What should you do if you encounter sawflies at this time of the season? Our deciduous trees and shrubs have done most of their work by this time of year; so pesticide sprays will mostly be a form of revenge for past deeds. Save your money and time and let Mother Nature settle the sawfly issue. The first frost is just around the corner. Leaves and sawflies will soon be gone. One urban legend has it that harvestmen (daddy long-legs) have the most toxic bite in the arthropod world. Is this legend fact or fiction? Answer: The daddy long-leg does not have the most powerful bite. This is a myth.